We are here to provide you with the hottest and latest sports cards and collectibles. You can see the condition of all the cards in the scans. If there are creases we will provide that information. 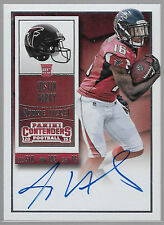 2015 Gridiron Kings Justin Hardy AUTO RC, SP #/249 Falcons Rookie! This is for a 2015 Panini GRIDIRON KINGS ROOKIE IMPRESSIONIST INK AUTO # II-JH JUSTIN HARDY Rc ! Card is serial #'rd /249 ! JUSTIN HARDY 2016 PANINI INFINITY INFINITE INK AUTOGRAPH #'rd /288 !! This is for a super nice 2016 Panini INFINITY INFINITE INK AUTOGRAPH # II-JH JUSTIN HARDY. Card is serial #'rd 212/288 ! 2015 PANINI PLAYBOOK NFL. #58 JUSTIN HARDY. PLATINUM PARALLEL DUAL JUMBO 3 COLOR ROOKIE PATCH BOOKLET CARD. Nice Autograph Blue Ink (On card auto). LOT, THEN IT IS FOR ONE CARD. OTHERWISE, IT IS FOR ONE CARD AND EACH PICTURE (IF THERE IS MORE THAN ONE PICTURE) AND SERIAL NUMBER REPRESENTS ONE OF EACH OF THE CARDS FOR. 2015 Panini NFL Football Cards. Team: Atlanta Falcons. Year / Season - 2015. Year: 2015. 2015 Football Cards. Player: Justin Hardy. Manufacturer - Panini. Set - Rookies. 2015 PANINI SPECTRA. #/50 Justin Hardy RC PATCH AUTOGRAPH! Radiant RookiesNEON BLUE Parallel# 5/50. 2015 PANINI CERTIFIED NFL. #207 JUSTIN HARDY. 3 COLOR PATCH AUTOGRAPH ROOKIE CARD. ATLANTA FALCONS. 2015 SPECTRA. JUSTIN HARDY. Dual Jersey 105/199, 189/199. Great Prices and Communication. 2015 PANINI PRIZM FOOTBALL - STARS, ROOKIE RC'S - WHO DO YOU NEED!!! COMBINED S&H We will send you an invoice. It is up to you to keep up with what you buy! All cards listed are NRMT-MT or better (based on Beckett Condition Guide) unless otherwise stated! We do not grade cards. 2015 Panini Prizm JUSTIN HARDY #254 BLUE PRIZM. Check out my store for many more cards. Will combine shipping with one combined payment. Thanks for looking. Set: 2015 Panini Prizm. Team: Atlanta Falcons. Year: 2015. Player: Justin Hardy. Item#: 254. Manufacturer: Panini Group. Attributes: Rookie. Item Condition: Near Mint/Mint. 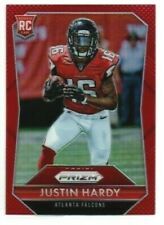 2015 Panini Prizm Blue Prizms 254 Justin Hardy. Set: Blue Prizms. Product: Panini Prizm. Year: 2015. Card Number: 254. Any green lines or marks are from the scanner and not on the actual card. All scans are of the actual card you will recieve.